These 4 Cheese Quiche Bites are the ideal appetizer. Just stir, bake and slice and you have bite-size appetizers for a crowd. 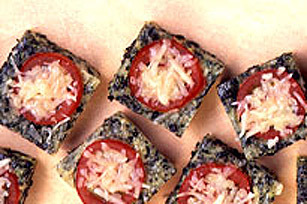 STIR together all ingredients except tomatoes & 1/4 cup Italiano Cheese; pour into a lightly greased 9-inch square pan. Top with tomatoes. BAKE at 350 °F for 15 to 20 min. Sprinkle with reserved cheese; cover & let stand 15 min. Cut into 1-1/2-inch squares.